Our cottages are available on a weekly basis Saturday through Saturday. Exceptions are made during the Off-Season, and sometimes, during In-Season. Check in time is 3 PM and check out time is 9 AM on Saturdays. If you intend to arrive after 6 PM please contact us during business hours to make arrangements to pick up your key. Guests who check in late must return to the office the following day to register and pay for the balance of their stay. We accept payment with cash, checks, and credit cards. When choosing to pay with a credit card, whether for a deposit payment or daily/weekly rental payment, a 3% fee will be added to the rental rates at the time of payment. 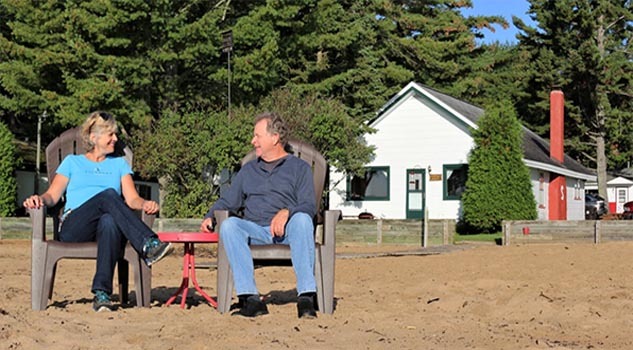 To reserve a cottage $200 deposit is required per cottage per week to confirm your reservation. The balance is due upon arrival. To reserve a motel unit a $100 deposit per room is required. You must be 21 years of age or older to rent our cottages. As required by law Michigan sales tax and local taxes will be added to our rental rate. Deposits for reservations that are canceled more than 30 days in advance of the reservation date will be refunded. A reasonable number of non-registered visitors are permitted during daylight hours but only when accompanied by registered guests of Sandy Shores. Please let us know if you’re intending to have visitors stop by. Only registered guests of Sandy Shores are allowed on the premises after dark. Smoking is not allowed in any of our buildings. When smoking outside, please be considerate of others and dispose of cigarette butts in the containers that are provided. Sorry, but pets are not allowed. The Golden Acres Kennel is located nearby and can be reached at (906) 786-5308. We are very fond of our property, our cottages and our beach. Please help us keep them clean. Trash containers are placed throughout the property for your use. If you need to remove trash from your cottage, bag it securely and place it in one of our designated outdoor containers. We perform regular maintenance on our cottages and make every effort to keep everything in good working order. Occasionally however, something may malfunction. While we cannot offer refunds or discounts for such malfunctions, we will make every effort to correct any deficiencies as soon as possible during regular business hours. Please report all maintenance problems to us immediately. Bed linens and an adequate number of bathroom and kitchen towels are included. We do not provide beach towels. Guests are responsible for their own towel and linen maintenance during their stay. We do not offer maid service or laundry service. $100 minimum – Should any incidence of property negligence occur, guests will be emailed an invoice for a fine with request for immediate payment. No future reservations will be accepted from this party if the fine is not paid in the timely manner requested. Although our beach is shallow and great for swimming, Lake Michigan is large and deep and the winds and currents can be unpredictable. As with any beach area that does not provide lifeguards, use the buddy system when swimming. We recommend that parents supervise their children closely when swimming and playing on the beach. Please do not light off fireworks anywhere on our property. The fire pits are for your enjoyment. We have a limited amount of firewood available, but driftwood is plentiful and free. Please burn only firewood or driftwood in the pits. Don’t burn garbage or cigarette butts or put aluminum cans in the fire pits. If you’re the last one at the fire, please put the fire out with water. Please respect the privacy of other guests especially after dark. Please spend your time quietly after 11:00PM. Parking spaces are limited, so please park in designated parking spots only. If you have a boat trailer we’ll provide you with specific parking instructions. Our property only supports a maximum of 2 vehicles per cottage. 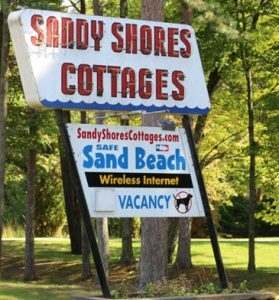 Sandy Shores is located on a quiet section of beach in a semi-wooded area and wildlife is common here. Guests will sometimes see bald eagles, deer, raccoons, hummingbirds, turtles, frogs, chipmunks. Occasionally a less desirable species like a bat, skunk, opossum, spider or non-poisonous snake is seen. We ask you to use caution and avoid all contact with animals. We make every attempt to keep unwanted insects and pests out of our cottages, but sometimes entry is impossible to prevent. Please report any unusual incidents to us immediately. We reserve the right to refuse service to anyone who doesn’t comply with our terms.